Precious metals were pounded lower Thursday as the U.S. dollar firmed. Palladium dived nearly 8%, silver marked a more than three-month low, and gold finished below $1,300 an ounce for the first time since the middle of the month. Gold for June delivery — the new, most active contract — declined $21.60, or 1.6%, to settle at $1,295.30 an ounce on the Comex division of the New York Mercantile Exchange. The settlement was the lowest since March 14. 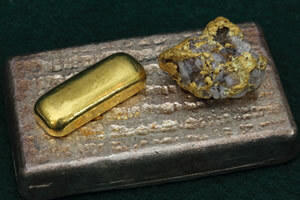 The precious metals bulls are fading fast late this week amid a resurgent U.S. dollar index that is pushing toward its recent multi-month high," Jim Wyckoff, a senior analyst at Kitco Metals Inc., said in a daily note. "Gold and silver bulls have company, as much of the raw commodity sector was punished today by the stronger greenback," Wyckoff added. Gold futures ranged from a low of $1,293.30 to a high of $1,317.60. They shed 0.4% on Wednesday, fell 0.6% on Tuesday, and advanced 0.8% on Monday — ending at their best level since Feb. 26. Silver for May delivery tumbled 32.5 cents, or 2.1%, to settle at $14.973 an ounce. The close was the lowest since Dec. 24. Silver futures traded between $14.95 and $15.32. They fell 0.9% on Wednesday, declined 0.9% on Tuesday, and rose 1% on Monday — marking their best close since Feb. 28. July platinum lost $18.40, or 2.1%, to $843.80 an ounce, ranging from $838.70 to $870.70. Palladium for June delivery sank $111.80, or 7.9%, to $1,309.70 an ounce, trading between $1,303.20 and $1,424.80. They dropped 6.2% on Wednesday. The metal is poised for a more than 13.5% loss on the week. Last week Wednesday, March 20, palladium scored a record settlement of $1,560.40 an ounce. Gold declined $14.55, or 1.1%, to $1,295.15 an ounce. Silver dropped 20.5 cents, or 1.3%, to $15.195 an ounce.